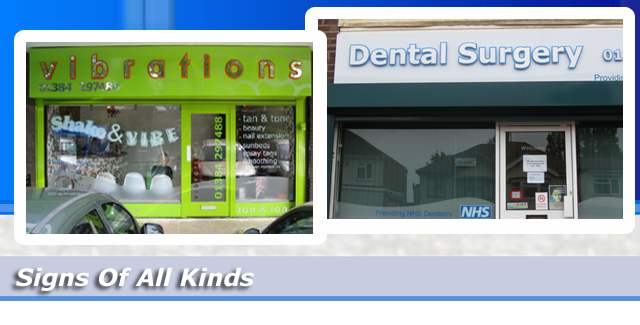 Here at Sign Wizards, our team pride themselves in offering customers a professional, friendly and reliable service. We provide everything your business needs when it comes signage and provide the highest quality company and shop signs in the Dudley and Birmingham area of the West Midlands. Our site visits are usually free and during the visit we discuss all elements of the signage that you are looking for, and our advice means that you maximise the potential of the signage required. Visits are arranged to suit you the customer at a time that is suitable for both you and us. All of our signs are made to order, and can be made to your bespoke requirements. This enables us to offer a complete sign service. We can manage every aspect from design through to installation. We can cater for the simplest of signs using vinyl lettering and graphics, through to illuminated LED signage. We offer only the highest quality materials, so you can be rest assured that you will be delighted in the finished product, and you wont be disappointed in our dedicated in house sevice. All of our signs are manufactured in house. This ranges from sign panels through to sign trays, moulded and flat cut letters and banners. We offer a full fitting service to all out customers, and we are able to book times that are convenient for you, our customer. There are a wide ranger of materials available ranging from Foamex (PVC) available in a satin or gloss finish and are weather resistant. thickness ranges of 3-5mm and 10mm, 15mm and 20mm in white only, in a variety of sheet sizes. Perfect for cutting to nay shape that you require. Acrylic panels are available in a variety of colours and thickness of panels. Aluminium composite panels are one of the most popular choices. as you don’t always need any frame. available in a choice of colours and finishes. ACM is basically a plastic core with aluminium skimmed each side. Aluminium frame has been available for a long time in the sign industry and has always been very popular. this is for a couple of reasons, firstly it finishes off a sign panel, and secondly ease of fitting. framing is available as a standard anodised silver, or you could choose to have it powder coated to match the text on your sign! Basically this type of sign is made by folding an aluminium panel so that it makes it into a box shape. Returns are available to your specification. Once the sign is fitted it gives a 3D effect instead of having a flat panel, with no visible face fixings.